This article was first published online by DFM News on May 8, 2012. As Fort Delaware State Park kicked off its 2012 season last weekend, park rangers and guides started enlisting visitors to help the park’s seldom-seen bats. Visitors to the fort are being asked to assist in the effort to curb the spread of the disease known as white-nose syndrome (WNS) to other parts of the country. Around 6 million bats have succumbed to a deadly fungus in just five years in the eastern United States and Canada. Some species, such as the little brown bat, have lost of 90-95 percent of their populations. This winter, the culprit took up residence in Fort Delaware State Park. Niederriter oversees the state park’s bat program. After finding a few sick bats at the fort this winter, her job instantly got more complicated. Hi. 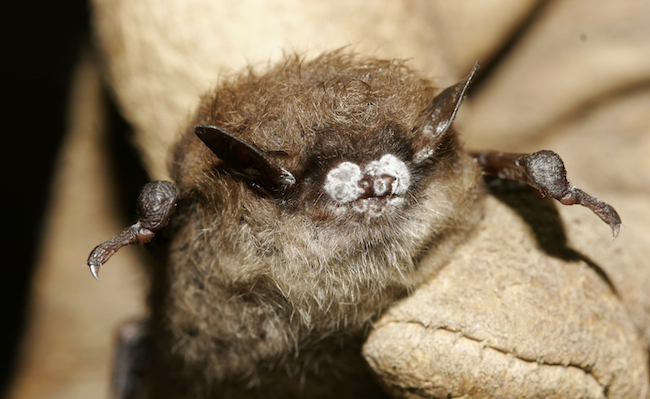 We have recently launched a nonprofit initiative to raise funds solely for white-nose syndrome research and conservation efforts, thru donations and the sale of batstuff.